It’s again this time of the year for developers to gather at the FOSDEM event in Brussels at the ULB. We’ll definitely be attending, so feel free to say hello if you see us! Be sure not to miss one of this year’s most notable speakers, Richard Stallman! If you can’t attend on Sunday, he’s also giving a talk on Friday at the VUB. For the schedule and practical information, head over to https://fosdem.org/2016/. Our long overdue redesign of spotia.com is finally here! As you’ll notice, we’ve retained the all familiar brand colors and most of the navigation bar, but changed all content to better reflect what we do (our 4 main pillars are Development – Business Software – Marketing – Infrastructure), including the new case studies page which gives a detailed overview of some of the work we did for our customers. 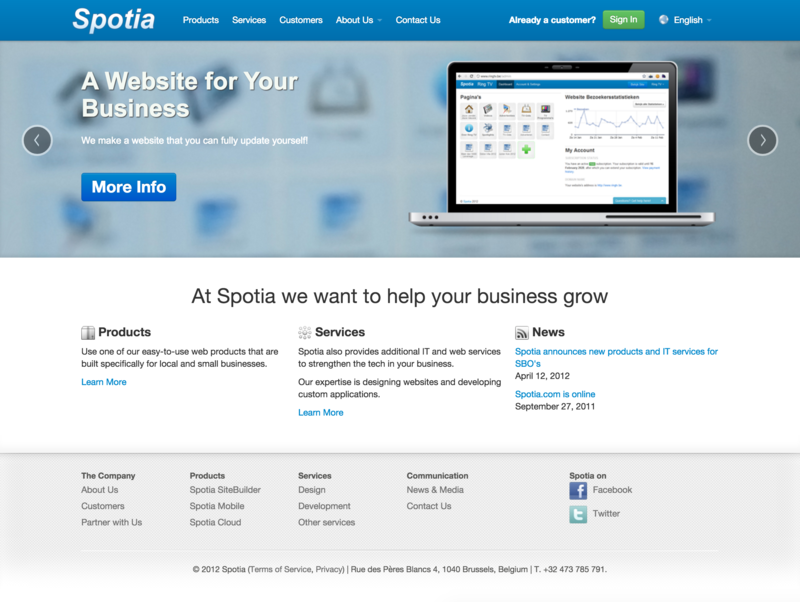 We are finally ready to start offering our Spotia SiteBuilder to the broader public, i.e. small businesses in Belgium. Spotia SiteBuilder has been in the making for over a year and version 2.0 has been released a few weeks ago. We are now actively looking for new customers and forging new partnerships to boost this process. We have also decided to offer additional IT services as the demand for this has grown. Beside the subscription-based SaaS products that we are developing, we will be doing custom work ranging from web development, SEO, graphic design and more. See our new services page for the full list. We are working together with a few other agencies to make this possible. Last but not least, we would like to announce a new product in the making, called Spotia Mobile: a tool for local businesses to create a mobile version of their website. Mobile is a booming industry, and is becoming more and more important for local businesses. Spotia would like to focus more on mobile in the near future and bring out a number of innovative mobile products with the aim of attracting new customers for the local businesses. Today we’ve finally launched the first version of our homepage, to give everyone a better idea of what exactly Spotia is and what we are trying to do. So have a look! We’ve also been hard at work developing our web builder the last couple of months, and are planning to release our product to the market in November.